By Costa Maragos Posted: December 16, 2016 9:00 a.m.
U of R artists are opening doors to a vast, new audience thanks to their presence at Southeast Asia’s largest and most influential art exhibit. The Kochi-Muzris Contemporary Art Biennale has now opened in Kochi, India, located in that country’s southwest coast. This sprawling international exhibition of contemporary art hosts dozens of artists from 31 countries. The Biennale encourages site-specific works and collaborations with Indian artists. It attracts nearly half a million visitors throughout its run from December to March. The University of Regina is well represented at the Biennale. Dr. Risa Horowitz, visual arts professor in the faculty of Media, Art, and Performance. Wayne Baerwaldt, exhibition co-curator and U of R Michele Sereda Artist in Resident for social-engaged practice. Zachari Logan, sessional instructor in the department of visual arts. Other artists presenting are Terry Billings, Gábriela García-Luna and Sheila Spence. "Our inclusion in the Biennale allows us the opportunity to make contact with leading creative minds in India and from around the world, and it is an especially rare opportunity to visit our Indian visual and media artists and curators on their own turf,” says Baerwaldt. "Experiencing India's complex cultures up close can only lead to fruitful artistic, intellectual and commercial exchanges. 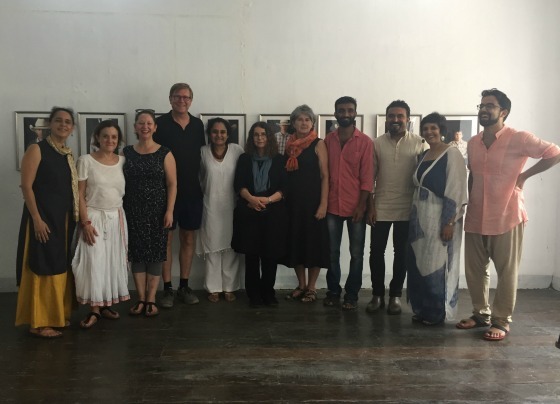 This trip to Kochi is a remarkable chance to both promote prairie artists to a burgeoning art market, and initiate ongoing creative exchanges in the visual and media arts for the benefit of students, faculty and staff at the University of Regina and the broader publics we serve." The exhibition presents a range of perspectives on the themes of silence and landscape, drawing attention to evolving concepts of ecological and environmental change and our fragile nature and farming systems that are in jeopardy in both Canada and India. Landscape and Silence is co-curated by Wayne Baerwaldt and Tanya Abraham, and is presented by Kashi Art Gallery as a collateral project of the Kochi-Muziris Biennale. Each artist is exploring new dimensions for concepts of silence through the landscapes in our era. Here are some examples. Horowitz has prepared the series Starfields and Fields, which combines her astronomical and large-format pinhole photography of landscapes across Canada. “I’m so grateful that I can go on this trip,” says Horowitz. “Being able to travel to the other side of the planet and participate in some cross-cultural exchange and get to know the international art scene at the Bienalli and meeting with other artists, curators, cultural producers and researchers is a once in a lifetime opportunity. Logan’s drawings present natural, if idealized, representations of seasonal portraits of wild plant life in Saskatchewan. The exhibition formally opened December 11th. The artists are taking part in lectures, a photography workshop, meetings with Indian art collections and fellow Biennale and Indian artists, educators and curators. The opportunity to present at this prestigious exhibition was possible, thanks to funding agencies that include Creative Saskatchewan, Canada Council for the Arts, Saskatchewan Arts Board and other agencies. Funding was also provided by the University of Regina and the Faculty of Media, Arts, and Performance.